NOTE: If you are using pokeruby or pokeemerald, this tutorial is not relevant to you. This is for those who are still using binary hacking tools and methods. Attached are copies of Lu-Ho's tools "Animation Editor" and "Door Animation Editor", with the ini's fixed to be friendlier to EM than the original versions. You should grab those, a ROM of your choice, and a hex editor (I like HxD) - optional, but useful. These tools are useful because they let you view a proper preview of how your animation will look in-game. 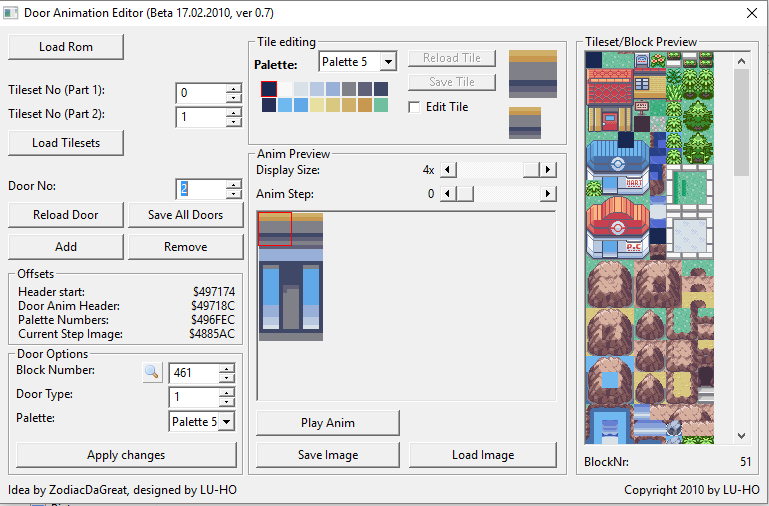 Cheers to NarutoActor who wrote an animation editing tutorial that introduced me to creating my own animated tiles many moons ago, and of course to Lu-Ho for creating user-friendly tools to make the job easier. I'd also like to give thanks to Tainted for the heads-up about 16x16 doors in EM! Please note that this tutorial only covers how to edit existing animations and not add new ones for the moment, although that might come later if it's necessary. Open up your ROM in Door Animation Editor and you'll see the same interface as the above image - simple enough, right? You can scroll through each door in any tileset using the clearly named buttons, and see how the animation will look in-game. You can edit each door frame by hand if you choose to - alternatively, if you already have your desired frames in the correct palette you can use the "Load Image" option to import them. There's not a lot to explain because it's so easy to use. Open your ROM in your hex editor and jump to this offset. 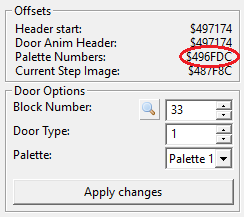 As you should be able to see, the number here is 01, same as the number of our door's palette. Change this to your desired palette number (in hex!) and save. I'll use palette 3 for tutorial purposes. 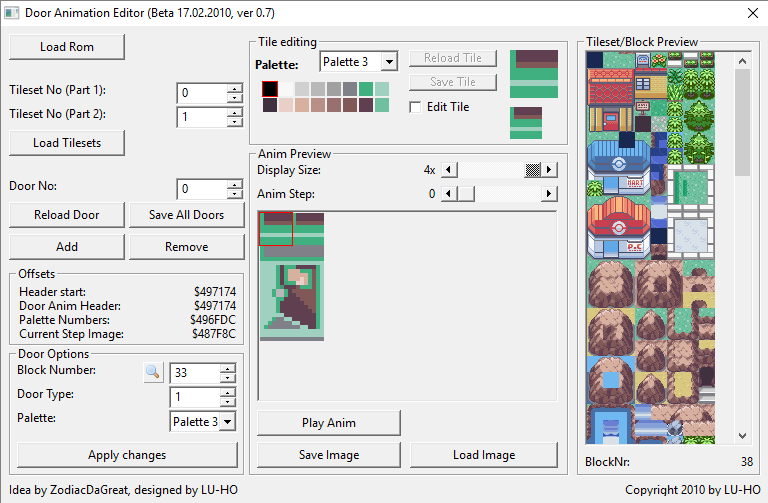 After saving the changes you made, if you did everything correctly you should see your door with its new palette when you open your ROM in Door Anim Editor again. 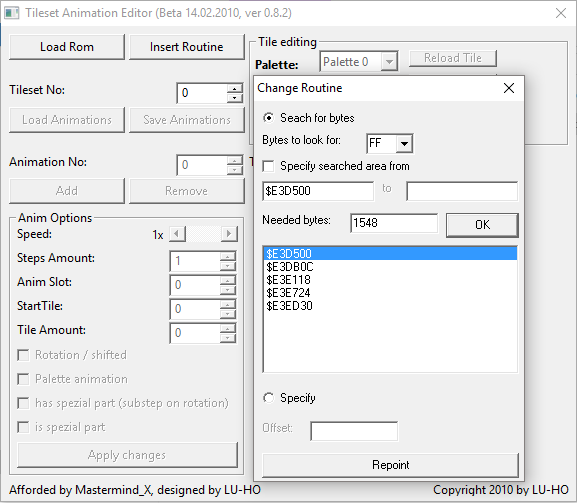 I personally prefer to use Lu-Ho's animation editor to draw the images first as it lets you see the animated frames in action. If you already have frames of the correct palette ready to insert, you could just jump to the offset and import through NSE, but this way is the most beginner-friendly. FRLG's doors have dimensions of 16x16 - RSE differs from this in that doors are twice as tall at 16x32. This means you either have to have tall cathedral-worthy doors, or have the top part of your door be part of a roof if you like the look of a 16x24 door. But what if you wanted a 16x16 square door in your Emerald hack, just like FR has? Here is where your hex editor will come in handy. ... There we go! 16x16 door animations a la FRLG in Emerald. Unfortunately, this tool requires the insertion of an ASM routine to run. Use the tool's internal free space finder to choose an appropriate offset with enough free space. Once you've done this, you'll be able to view most animations - some, such as the tall grass, are not present here. "StartTile" is the number of the 8x8 block on the tileset where the animation is contained. "Steps Amount" is also self-explanatory - it's the number of frames the animation has. "Tile Amount" is how many 8x8 blocks the animation set consists of. All you have to do once you've made the changes you want is hit "Save Animations" and you're done. I personally haven't messed with the other parts of this tool such as adding animations or using its other features, but if you have I'd be happy to hear from you so we can add it here! Last edited by Avara; 16th December 2018 at 02:50 PM.